MassDOT is seeking input through the end of the month on their newly released Draft Bicycle Transportation Plan, a comprehensive guide to future development that aims to “reverse the decades-long practice of prioritizing automobile travel over all other modes by granting people biking the same level of importance as drivers in planning, design and maintenance processes.” Though the plan is so far light on specifics, that mission statement is a great starting point and an encouraging sign of MassDOT’s willingness to work with us and to continue showing more leadership on this issue. To help ensure this bold vision translates into action, share your feedback about the plan to MassDOT by January 31. We commend MassDOT for creating a plan to encourage everyday biking as a safe, comfortable, and convenient option. Fifty-two percent of all trips in Massachusetts are three miles or less, yet 80% of those trips are made in vehicles. Bikes could replace cars for many of these trips, and we know people are willing to make that change — but only if they feel safe doing so. 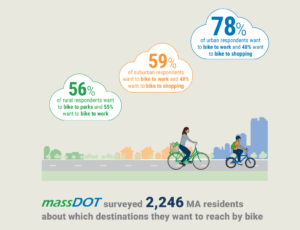 In a survey of 2,246 residents, MassDOT found that 78% of urban respondents want to bike to work, but disconnected and high-stress roadways, combined with unreliable road maintenance, remain significant barriers. We are also pleased to see that MassDOT has created a “Potential for Everyday Biking” analysis, which predicts where people would regularly bike if safe bikeways were accessible, that will be used to prioritize bike infrastructure in impactful areas. We encourage you to read the full plan, and to submit feedback here. Initiative 1: Build connected bicycle and trail networks and close critical gaps with local, regional, and state partners and close critical gaps. Combine the “Potential for Everyday Biking” Analysis with crash data to develop a short list of priority projects for the next 1-3 years that can most significantly reduce the likelihood of injuries. Adding to point 1.3, please hold accountable other state agencies that own and manage roads to the highest standards for safety for bike infrastructure as included in the Municipal Resource Guide for Bikeability. With regards to “Measures for Tracking Progress”, what is the goal for the number of miles of high-comfort bikeways created on state roadways that could get people from residential areas to job centers. Without a target, how will we collectively measure success? Initiative 2: Integrate and promote the safety, comfort, and convenience of people biking in transportation and development processes. Initiative 3: Promote roadway safety through education and programs for people driving, people bicycling, and potential for everyday bicyclists. Initiative 5: Launch the development of a year-round maintenance and operations plan for MassDOT-owned bikeways and support municipalities to do the same. Please prioritize point 5.1 around developing a winter maintenance plan. This plan should be based on upholding the safety standards for physical separation for cyclists on a year-round basis.